Classic Fortean Times article resurrected! Back when 'dialing up' the Internet required earplugs, and the once-glorious Teletext reigned supreme, there admittedly wasn't all that much in terms of online Ghostwatch-related reference material. 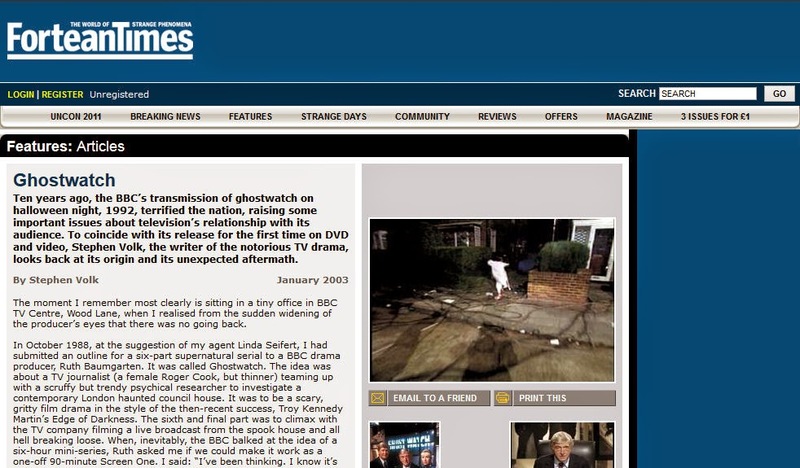 Among those few classic web-pages, including Stephen Freestone's much-loved ghostwatch.info, Fortean Times magazine published a highly-informative piece written by Stephen Volk, that until very recently, could still be read, twelve years on. Ten years ago, the BBC’s transmission of ghostwatch on halloween night, 1992, terrified the nation, raising some important issues about television’s relationship with its audience. To coincide with its release for the first time on DVD and video, Stephen Volk, the writer of the notorious TV drama, looks back at its origin and its unexpected aftermath. The moment I remember most clearly is sitting in a tiny office in BBC TV Centre, Wood Lane, when I realised from the sudden widening of the producer’s eyes that there was no going back. From the beginning, our intent with Ghostwatch was both to create a damn good ghost story for television (something I had sorely missed since Nigel Kneale’s 1972 The Stone Tape), and, secondly, to surreptitiously say something about television itself. I grew up with Hammer films, the ubiquitous Pan books of horror stories, and the BBC’s Ghost Stories for Christmas, and it struck me that many of the most effective supernatural stories I enjoyed in literature (from Dracula to The Turn of the Screw) used a “this really happened”, pseudo-documentary approach. But how could one achieve that in television drama? Edgar Allan Poe’s stories often played such a trick by mimicking the factual articles that appeared around them in the publications where they first appeared. And that, obviously, was the answer: to make a TV drama that resembled the factual programmes surrounding it. Beyond that, what interested me as a dramatist was to play with the idea of the audience, complicit and apparently affecting what they were seeing on screen. Hilary Evans’s evocative theory of the “need-based experience” – the idea that people under certain psychological, cultural or social conditions will see just what they expect to see – made eminent good sense to me, linking as it did ghost sightings, UFO experiences and even visions of the Virgin Mary, and pointing up the similarities between them.1 Extrapolate this, I thought, to the people making up a massive audience of TV viewers (millions of whom had tuned in to see, for instance, who killed JR); what if their need to see a ghost actually made it happen? Certain other ideas coalesced as I was writing the many different versions of Ghostwatch that were developed before the BBC gave it a dim and flickering green light. I, of course, remembered vividly the 1973 Dimbleby Talk-In, which had made a star of Uri Geller and spoon-benders of half the nation’s youth. I remembered the scientific experts who believed what they saw and convinced us, the audience, along with them.2 I was also well aware of the famous “Philip” ghost, a totally fictitious apparition created by eight members of the Toronto Society for Psychical Research in 1972, who took on a life, or mind, of his own. He succeeded even to the extent of making his presence felt during a séance enacted on an American TV show and overturning a heavy table.3 It seemed to me that this was a “supernatural” event created by television if ever there was one. By comparison, it didn’t seem that the premise of Ghostwatch was too unbelievable at all. But Ghostwatch was, of course, also about television. It’s quite difficult now to think back to the televisual landscape of 1992. Formats that dissolve the boundaries between factual and fictional TV have since become the staple diet of the schedules, and it’s difficult to imagine a world where they were new or unusual. But this was the time of the first successful hybrids: docu-dramas and drama-docs. Drama series like NYPD Blue increasingly employed a hand-held camera style derived from documentary realism, and documentaries like Crimewatch and 999 were full of reconstructions using actors mix-and-matched to real footage of real people. Ruth, the producer, and I discussed how we both felt we could no longer trust what we were seeing, what we were being shown or told by TV. The lines between the once distinct languages of factual and fictional TV were becoming dangerously blurred. Even the CNN Gulf War reports on Newsnight (with the infrared camerawork we duplicated in Ghostwatch) felt suspect, somehow unreliable. What was drama and what was not? Though this was our theme, it was never our intention to simply “trick” the audience. One thing I can say categorically is that, in all our many discussions at the BBC, we never, ever used the words “hoax” or “spoof.” To us, Ghostwatch was a scripted drama that we decided to make in a certain form – that of a “live” TV show – in order to make it more effective. We thought that people might be puzzled for two, perhaps five minutes, but then they would surely “get” it, and enjoy it for what it was – a drama. The curious thing about Ghostwatch is that while one part of the audience didn’t buy it for a second, another part believed it was real from beginning to end. The reactions ranged from one person who thought it could have been a lot scarier to a woman viewer who demanded recompense from the BBC for a pair of jeans because her husband was so terrified he had soiled himself. None of us could have anticipated the scale or diversity of its impact on its audience. The director, Lesley Manning, who had worked with Ruth before on another Screen One, My Sister Wife, immediately clicked with our intentions. She combined talent and enthusiasm with incredible analytical nous, and, virtually unheard of in a director, complete lack of ego. She helped shape the original idea, of a kind of Terry Wogan telethon involving locations across the whole country, to instead focus on one poltergeist-infested household and one dysfunctional family. Ghostwatch did not go out “live” as some people presume: it would have been logistically impossible. Lesley shot it in the Summer of 1992, first at the house, in long, complicated takes to achieve the “as if live” feel. Then it was up to Michael Parkinson and Gillian Bevan (playing Dr Pascoe) to react to the footage on playback in the studio. Knowing that we had an anchorman of 25 years’ experience in the part, both Lesley and I encouraged Michael to veer off the script in any way he thought comfortable. The script was sent to Sarah Greene, who we wanted to play the intrepid reporter. Her real-life husband Mike Smith was interested in being in it too. When Ruth told me, I jumped at the chance to write in a husband-wife relationship to add suspense to the proceedings. Our strategy was always to ask ourselves, OK, if the BBC were really doing this, who would they get? And, of course, they’d get Craig Charles to act the goat. While shooting was underway, we still had no idea that the BBC would give us the essential slot on Hallowe’en night. Nevertheless, Lesley made an incredible leap of faith, and decorated the Early family’s house in Northolt with pumpkins and apples on string – which would have been a little stupid if our transmission was knocked back to December. Luckily, it paid off. We were later accused, by people who imagined the story was happening live, that the poor children (sisters in real life) must have been traumatised by the sadistic film-makers. In fact, the two girls loved it. They were celebrities at school afterwards, and everybody wanted their autographs. On 31 October 1992, cast and crew met for drinks and to watch the show going out “live” at 9.30. Right up until the last minute, the transmission was threatened with being pulled due to corporate nervousness, but we made it by the skin of our teeth. When Ruth arrived from TV centre to report that the BBC phone lines were jammed, we knew we had created an effect far beyond anything we had anticipated. Remarkably, for a show ending at 9.30pm the night before, the headlines appeared in the Sunday papers, almost all reflecting public outrage: “TV Spoof Spooks Viewers” (Sunday Mirror) “Parky Panned for Halloween Fright” (News of the World) “Viewers Blast BBC’s ‘Sick’ Ghost Hoax” (The Sun, Monday, 2 Nov). Predictably, Gary Bushell claimed the BBC had “dropped a ghoulie” and Private Eye even reported a “Parkynormal” experience. In all the furore about being hoodwinked and taken for fools, hardly anyone discussed Ghostwatch as what it was: a piece of drama. The lady serving in my local off-license said, “I’ve got a bone to pick with you. My son wouldn’t go to sleep till we took the luminous skeleton off the back of his bedroom door!” (To which, I thought, “What is he doing with a luminous skeleton on the back of his door in the first place?) If we were guilty of anything, we were guilty of underestimating the power of the language of “live TV” to convince people that what they are watching was real. On the Monday morning after transmission, school teachers cancelled lessons to discuss the programme. Kids across the country were arguing about whether “Pipes” the ghost actually appeared, and if so, how many times. The BBC’s Points of View on 4 November discussed the feedback of a lot of angry viewers, as did Sue Lawley’s Biteback programme on 15 November. In the latter, viewers, some of them incandescent with anger, berated Ruth Baumgarten and executive producer Richard Broke, while paradoxically interjecting with the occasional reminder that they thought that the programme was, “as a programme”, brilliant. 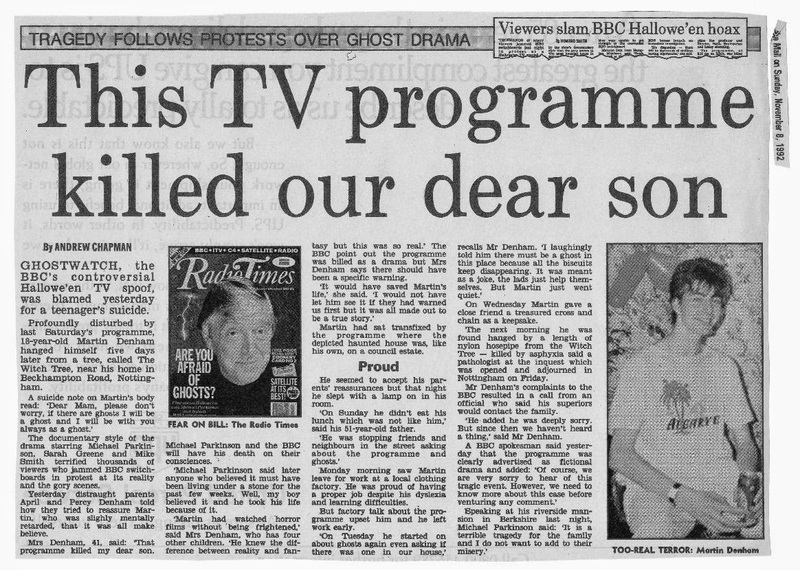 Newspaper reports on 8–9 November of the tragic suicide of Martin Denham, who had seen the programme, gave ammunition to those who accused Ghostwatch of being irresponsible programme-making. For those who didn’t hear the end of the story, it is worth pointing out that the coroner at the inquest did not even mention the drama. Nevertheless, the effect of all this was that the BBC clammed up and effectively disowned the programme, and subsequently behaved as though it had never happened. Allegedly, its nomination for a BAFTA award was quashed by the Powers That Be at the BBC. The Radio Times was ordered never to mention the programme again. (Even when Ruth, Lesley and I collaborated again on episodes of the BBC drama series Ghosts, Ghostwatch was never mentioned in the publicity.) I felt our work was like a dissident airbrushed out of a photograph in Stalinist Russia. Far from being proud of an unusual and provocative programme, the BBC clearly wanted to bury it. It was certainly absolutely clear it would never, ever get a repeat showing. It was cold comfort, but some relief to us, that the viewing figures were an incredible 11.1 million, one of the highest ever for a single drama on BBC1. But whether they, or we, liked it or not, the programme entered the cultural consciousness in some small way. Some time later, Sarah Greene and Mike Smith appeared on Hearts of Gold. When the lights suddenly went out in the studio the audience all blamed “Pipes.” And when Sarah sat next to Prince Andrew at the BAFTA Awards the following March, she told us all he wanted to talk about was Ghostwatch. As if to rub salt in the BBC’s wound, the show later earned the dubious honour of being the first TV programme to be cited in the British Medical Journal as having caused Post Traumatic Stress Disorder in children.5 I hate to say it, but as a horror-thriller writer, that’s a hard act to follow. Now it’s hard not to see the influence of Ghostwatch on some of the TV output of the last 10 years. Shortly after our programme in 1992, ITV ran a series called Strange But True in which a very “Parkinsonian” Michael Aspel introduced reconstructions of actual stories from the world of the paranormal. Chris Morris’s brilliant The Day Today ridiculed the same media language that we targeted; but very soon Paxman, gratuitous graphics, self-important hot-spot reporters and news-as-entertainment had became almost beyond parody. In the realm of GOGS (Good Old Ghost Stories), the Blair Witch Project used the techniques of hand-held documentary film, and the gag of elaborately (via the Internet) pretending it was all true, to hook the multiplex audience. A few people have told me that the film-makers have mentioned seeing Ghostwatch, but I have found no actual evidence of that (if anyone has, please let me know!). More recently, Marc Evans’ My Little Eye used reality TV techniques to create a believable modern slasher movie. Of course, nowadays the massive ratings-grabbing and social phenomenon Big Brother has taken voyeurism and the involvement/complicity of the audience to new heights and depths. One can see, without any effort of imagination at all, that if one were proposing Ghostwatch now, one would simply propose it as a “reality” show and do it for real. Of course nothing would happen except a lot of bitching and tears and someone peeing in the shower. Or would it? In spite of the vitriolic reaction in some quarters, over the last 10 years Ghostwatch has created a loyal fan base who “got” it and loved it. Apparently, pirate videos were available on the black market for £50, and I have been told by a university professor that almost every year at least one student in Media Studies will want to do their dissertation on Ghostwatch. Memories of watching it on the night are recounted on the excellent fan website, and aficionados regularly debate how many appearances of “Mr Pipes” there are on screen. I hope the release of the BFI DVD of Ghostwatch will give an opportunity for those who didn’t catch it in 1992 to see at last what the fuss was all about. And for those who were either sent to bed, age 10 (like one young film producer I recently met), or watched with their hands over their eyes, there is the opportunity to see what they missed. And to enjoy it, I hope, for what it is, without too many sleepless nights. The real-life inspiration for Ghostwatch’s tale of an everyday, urban haunting was the famous ‘Enfield Poltergeist’ case, in which the Harper family was terrorised by a series of poltergeist phenomena from August 1977 to September 1978. The analogues between the real and fictional cases are numerous. Like Mrs Early in the television programme, Mrs Harper was a divorced mother (of four rather than just two children), living in a semi-detached council house in Enfield (rather than Northolt), North London. In 1977, the family began to suffer from mysterious disturbances – items of furniture moving about, objects flying around the room and becoming very hot, knocking sounds, cold breezes and inexplicable wet patches. The Daily Mirror reported on the strange affair, and the Society for Psychical Research investigated. Maurice Grosse, then a fledgeling SPR researcher, became heavily involved in the case, as did Guy Lyon Playfair (who later acted as advisor on Ghostwatch). They were assaulted by flying marbles, saw doors opening of their own accord and items jumping from tables. The knocking sounds became an almost constant presence, eventually demonstrating a desire to communicate in the time-honoured ‘one rap for no, two raps for yes’ manner. Asked how long it had been in the house, the phantom rapper reputedly responded with a series of 53 knocks. The usual crop of camera failures and wiped cassette tapes frustrated the efforts of a growing army of investigators, although photographer Graham Morris captured some intriguing images of pillows flying across the children’s bedroom. Much of the poltergeist activity seemed to centre around 11-year-old Janet Harper, who was frequently pushed or pulled from her bed by invisible forces and sometimes spoke in a deep, male voice that uttered obscenities or described details of the life and death of a former occupant of the house (details that, according to Playfair, were subsequently confirmed, even though they had all taken place before Janet was born). If this wasn’t getting far enough into Exorcist territory, some witnesses claimed to have seen the girl levitating. Janet, after fruitless sessions with psychologists, spent six weeks in London’s Maudsley Hospital undergoing a barrage of tests – which revealed nothing out of the ordinary either physically or mentally. Grosse and Playfair, though, noted that – as in other polt cases – the presence of a pubescent girl seemed to be a key element. Others, including fellow SPR members, were unimpressed by the evidence and testimony collected by Grosse and Playfair, whom they suspected had merely encouraged the children, Janet especially, to give them what they wanted. Janet was certainly caught on a number of occasions (admittedly, late on in the investigation) faking supposedly supernatural phenomena (as is one of the Early children in Ghostwatch). A similar ‘experimenter effect’, of course, is one of the themes explored in Ghostwatch, which effectively implicates the entire viewing public in unleashing powerful, dangerous forces. For more on the case see: Guy Lyon Playfair, This House is Haunted, Sphere Books, 1981; FT 32:47-48, 33:4-5, 11. At the time of the Ghostwatch ‘flap’ in 1992, FT was one of the only magazines to take a look behind the tabloid outcry at the programme itself (see FT67:42). We asked a number of prominent veterans of genuine paranormal research and investigation for their opinions on the ethics and æsthetics of the programme. Guy Lyon Playfair, who acted in an advisory capacity to the programme-makers felt that much of Ghostwatch was “certainly true to life, notably theTV crew climbing all over the family’s home and directing their lives by remote control from Thought Control House”. Maurice Grosse of the Society for Psychical Research, who had actually investigated the Enfield case, felt that “it was well produced, but I do question whether it was right to portray a real case (thinly disguised as fake documentary) when the horror was so ridiculously overdone. I would have preferred the BBC to have made a factual film of the Enfield poltergeist case. It would have been more interesting, more dramatic and more convincing.” Tony Cornell, also of the SPR, was mostly concerned about the programme’s misrepresent-ation of polts as “uncontrollable, malevolent and evil entities”. For Maurice and Tony, fact was more interesting than fiction – which tends to overplay the more sensational aspects of the real drama – and their gripes were to do with the perceived accuracy and truthfulness of Ghostwatch’s dramatised case. For parapsychologist Sue Blackmore, though, there were greater ethical issues (rather than those of verisimilitude) at stake: “It treated the audience unfairly. It can be exciting to play on the edge of fantasy and reality, or stretch the accepted norms of television conventions, but this was neither true to its format nor fun. It was horrid to watch the distress of the girls, real or faked. I found it over-long and occasionally disgusting… The lack of adequate warnings was irresponsible”. Such concerns might seem odd, even rather prim, looking back from our current viewpoint; as Steven Volk rightly points out, the TV landscape in 1992 was a very different one from that of today, and the responses of FT’s experts reveal a concern with representation, ‘truth’ and responsibility that you’d be hard-pressed to come across in the early 21st century. The makers and consumers of television have become far more comfortable with the blurring of fact and fiction than was Ghostwatch’s original audience, many of whom expressed disgust and displeasure at being fooled, duped or betrayed by the homely box in the corner of their living rooms. If, since then, a culture of active complicity and collaboration between TV’s producers and consumers has become the new norm, then Ghostwatch remains a hugely prescient and perceptive moment in television history. For other film and TV ‘hoaxes’see: FT67:38-42 (Ghostwatch); FT64:47-49 (Alternative 3); FT120:40-43 (War of the Worlds); FT128:34-40 (Blair Witch Project). 2) See Superminds by John Taylor. 3) See ‘Philip the Phantom Phantom’ in Ghosts, ed Peter Brookesmith, Orbis Publishing, 1984. 4) see Superstition by Carole Compton with Gerald Cole, (Ebury Press, 1990). The film Superstition was released in 2001, starring Mark Strong and Sienna Guillory. 5) See ‘Trauma of boys who were haunted by TV’, (Daily Mail, Friday, February 4, 1994).